More than a decade ago, Ducati made a radical addition to its lineup of sporty and sport touring models: The Multistrada, a high-performance upright bike with good wind protection, long-travel suspension, and wacky styling. The most recent iteration combined huge power—160 horsepower—with state-of-the-art electronic aids, and was the fastest bike available when it came to real-world conditions. Some riders wondered if all that power and tech was really necessary to make an adventure bike enjoyable. Here’s Ducati’s answer to that question: the Multistrada 950. It’s simpler, lighter, and $6,000 cheaper. But does it still deliver the essential Multistrada experience? The new 950 is big, fast, and comfortable. If it weren’t for its more powerful brother, you might never think it was the small version of anything. Let me explain: In 2015, Ducati went completely over the top with an all-new, tech-packed Multistrada, the 1200 DVT. Variable valve timing allowed a torque bottom end and a screaming, superbike top-end. The bike also featured cornering-ABS. It was a brilliant system, powered by a six-axis accelerometer (called an Inertial Measurement Unit in bikespeak) that knew exactly what the bike was doing at any moment and told the ABS how much grip to expect mid-corner. The IMU also informed cornering lights that light up the road when the bike is leaned into a bend, and gave the bike improved traction and wheelie control. 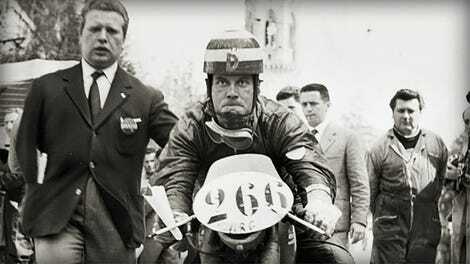 It was the ultimate motorcycle—overpowered, comfortable, and capable. Nothing was faster in real world conditions. New customers—even riders who had been loyal to other marques—came flocking; in 2015, the 1200 DVT was Ducati’s second-best selling bike, behind the Scrambler. It was with some trepidation, then, that I stepped aboard the just-released 2017 Multistrada 950, which is based on the same platform as the aformentioned 1200 DVT. What makes a Multistrada a Multistrada? Is it the tech, the ginormous power, the IMU, cornering lights, and electronic suspension… or the riding position, comfort, and rough-road capability? And could this thing hold up? It may have a smaller engine, but the 950 isn’t a miniaturized 1200; the two bikes share the same bars and triples, as well as the front plastics, tank, frame and subframe, though the 950’s seat area is missing a body panel or two, echoing the aggressive minimalism of the 1200 Enduro. 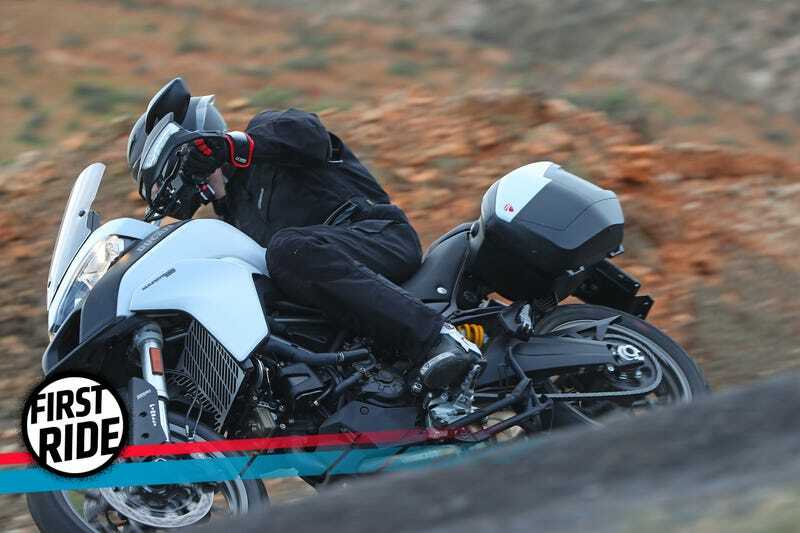 The V-twin in the “950” is actually 939cc, and comes straight from the Hyperstrada 939. It will also be used in the upcoming, much-anticipated Supersport. It’s worth noting that this engine—like the 1200—has 9000-mile service intervals and asks for valve-clearance checks every 18,000 miles (BMW, for comparison, recommends 12000-mile valve checks on their latest water-cooled R 1200 GS). The cost savings come primarily from the smaller engine—which does without variable valve timing—the electronic suspension, and the normal—rather than cornering—ABS. There are other differences, too. The 950 uses Brembo’s 4.32 calipers instead of the world-class M50 Monobloc calipers on the 1200 DVT, and it doesn’t have a single-sided swingarm, either. The fork internals are also different from those of the base 1200, which doesn’t have semi-active suspension. The upside? The 950 weighs 453 pounds dry, 15 less than the 1200 S.
Ducati’s build quality and attention to detail, however, remains. The mirrors come on the same burly aluminum stalks that the 1200’s get, there’s a DIN outlet on the dash, and a USB port—and another DIN—under the seat. The windscreen is adjustable while riding, too. With 113 HP, the 950’s power is never an issue, but it isn’t the bike’s showpiece, either. The 950’s raison d’être is accessibility. With a 19-inch front wheel and a 20mm offset on the fork legs, the steering is less twitchy than that of the 1200. Ride-by-wire allows configurable riding modes, and the rider can adjust the traction control, wheelie control, and ABS, as well as cut the power to as little as 75 HP. Sure, the bike may not have an IMU, but even the full 113 HP doesn’t get you into sketchy situations as easily as the big bike does. In Sport mode, it feels like there’s an actual cable connecting the throttle tube and the injector. In Urban, it feels like there’s an elastic band—which should help novice riders stay out of trouble. Ducati claims that 80 percent of the 71 ft-lbs of torque is available from 3500 to 9500 RPM. I believe it, and it was great for blasting around the twisty roads of our tests, but you won’t be screaming Yeah boooy! inside your helmet as you click into 4th at over 100 mph. Instead, it’s most enjoyable to exploit the midrange and blast around in 3rd and 4th, without ever really winding it out. On the launch though, we were in 2nd for the hairpins and clutching it up on the way out. I suspect that if you rode the 950 and the 1200 S back to back, the 1200 S would seem more appealing, but since it can be more fun to ride a slow bike fast (not that the 950 is in any way slow), the 950 would be less frustrating and better equilibrated with American roads than the 1200, because you’re not having to resist pulling the pin on a fearsome grenade of power on every straightaway. You could certainly be content with the 950 and its torque—exploiting the bike, but not having to worry about losing your license every time you rode it. That would be its price, $13,995 instead of the $20,095 of the 1200 S. It also weighs 15 pounds less, and is marginally easier to maneuver thanks to the 19-inch front wheel and different fork offset. On the 1200, you sometimes feel like you’re either a poser when you’re not using all the power, or a menace when you are. The 950 is easier to ride hard for long periods of time, simply because the power isn’t so manic. Those twisty mountain roads of Fuerteventura were generally smooth, and any choppy bits were soaked up by the suspension—which offers 170mm of travel at either end. The problem was front-end dive under braking. To reducing pitching, I added a few clicks of compression damping on the forks, and also increased rebound on the shock. Looking back, it could have done with a bit more fiddling—I was able to reduce dive a bit, but not to my satisfaction. Stiffer fork springs or a few more clicks of compression should do the trick. The Multistrada is a relatively heavy, tall bike, and the semi-active suspension on the 1200 S does a great job of camouflaging the weight by controlling the dive. On the 950, the front-end dive was less noticeable when we stopped riding flat-out. Ducati won’t be importing the version with panniers to North America, but the center stand and panniers are available for $969. Color-matched pannier panels are available for another $159. The $1849 aluminum panniers that fit on the MTS1200 Enduro also fit on the 950. Base price for the 950 is $13,995; if you love riding like a lunatic, the 1200 comes in at $17,995, and the 1200 S, with its TFT display, cornering lights, and semi-active suspension, will set you back $20,095. The six grand you save over the 1200 S could buy another interesting motorcycle, a lot of rider training, or a bike for a child, parent, or partner. Unless you’re really pushing it, the IMU and the extra 50 HP doesn’t really come into play. Whether that stuff matters is up to you. Even though the 1200’s upgrades are the icing on the cake, the simpler 950 is without doubt a tasty piece of cake—especially so if you regularly ride on interesting roads.